Get Your Truffle Shuffle On! No foodie on earth would snub their nose at a truffle. Especially not Italian truffles. They are one of Italy’s greatest culinary points of pride, and one of the world’s most expensive ingredients. In fact, these earthy nuggets of sheer deliciousness can go for up to hundreds, even thousands of euros a pop! There are several ways you can experience the truffle in Italy, from truffle hunts to fine dining and festivals. Here’s everything you need to know to get your truffle shuffle on! So what is a truffle, exactly? It’s a tuber. More precisely, it’s a fungus that grows underground, around the roots of certain trees (oak, poplar, etc.). When the fungus reproduces, it forms what we know as a truffle – a potent and delectable alien-looking tuber. Come autumn, hunters harvest them with specially trained dogs, who snuffle out the truffles (traditionally, truffle hunters also used pigs, but today this is rare). From there, truffle hunters sell their finds to chefs and connoisseurs at festivals, markets, and privately. That’s how they end up on your plate and in your belly! 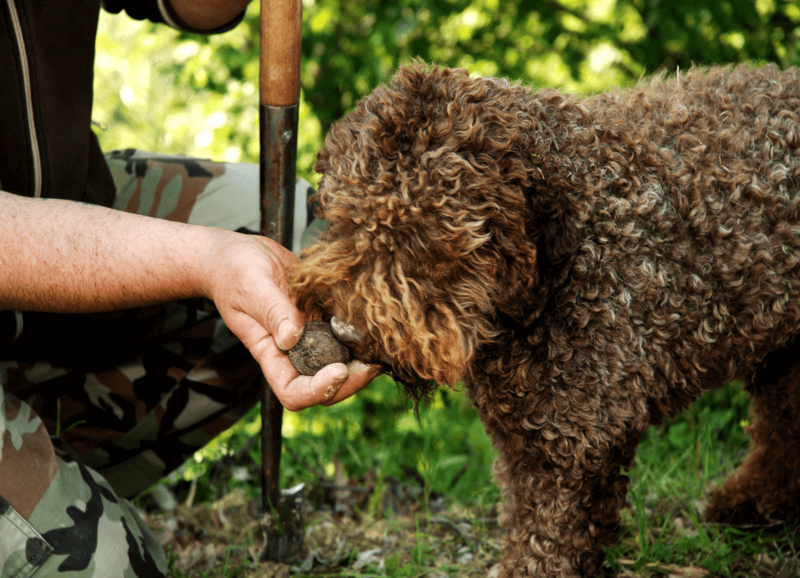 A Lagotto Romagnolo truffle hunting dog sniffs his find. 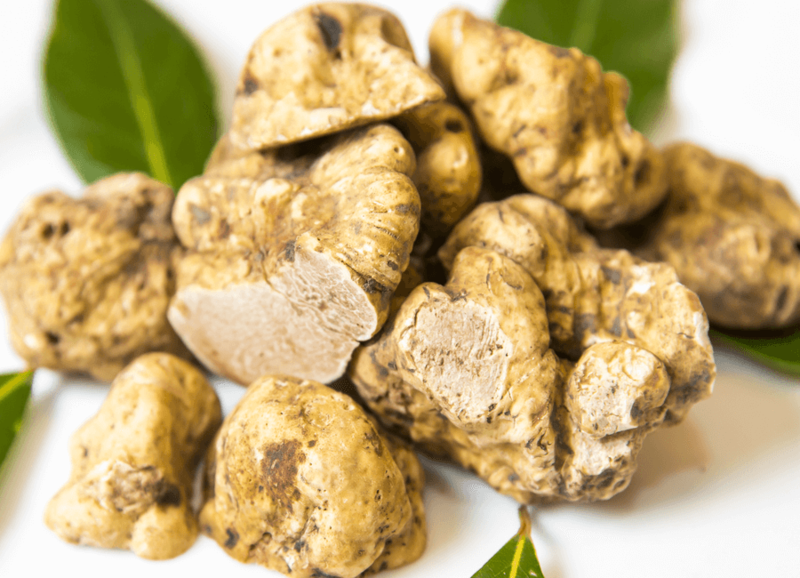 White truffles are rarer and more expensive than black truffles. 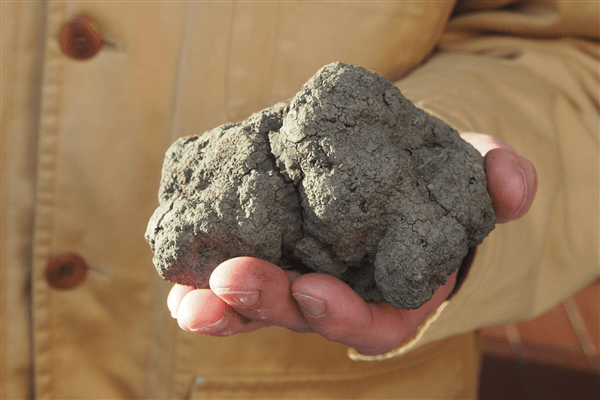 A good-sized truffle is normally the size of a man's fist. You may be wondering why on earth Italian truffles so expensive. This is because they are very difficult to farm, and only grow in certain soils. You can’t simply plant truffle seeds, you have to transplant the right tree at the right age into soils that already contain the fungus. The effort is worth the payoff, though. The world’s largest Italian truffle (below) sold in 2014 for over a million dollars! Shaved over a simple pasta dish, truffles fill the senses! Of course, you’ll find truffle on many menus in the cities and regions mentioned above. Always opt for dishes that are simple, so as not to overpower or over-complicate the unique taste and smell of the truffle. Traditional recipes include tajarin (a pasta dish), tagliolino al tartufo (another pasta dish) and mushroom and truffle salads, and even truffles with eggs, polenta and bread. Ristorante Piazza Duomo in Alba has 3 Michelin Stars, and was voted one of the World’s Top 50 Restaurants in 2016. 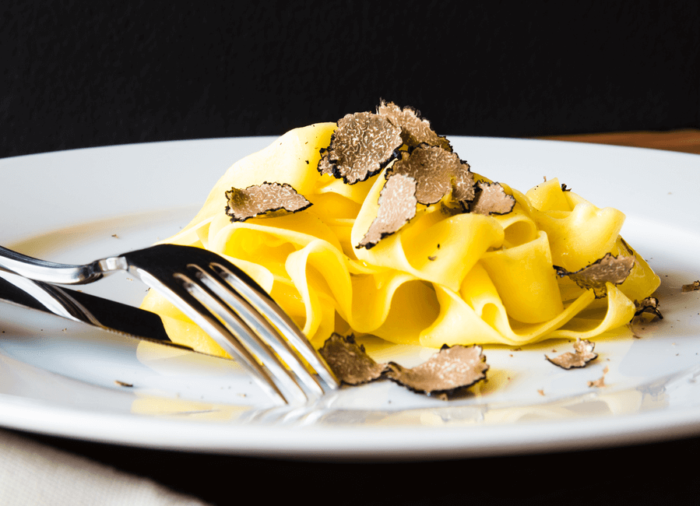 Their menu only features truffles in autumn, during the truffle harvest season, but it’s well worth the wait, trust us! White Italian truffles on show at a local fair. Visit Italy in autumn and you’re bound to come across a local truffle fair, especially between October and November. Most include more than just the exhibition of truffles. 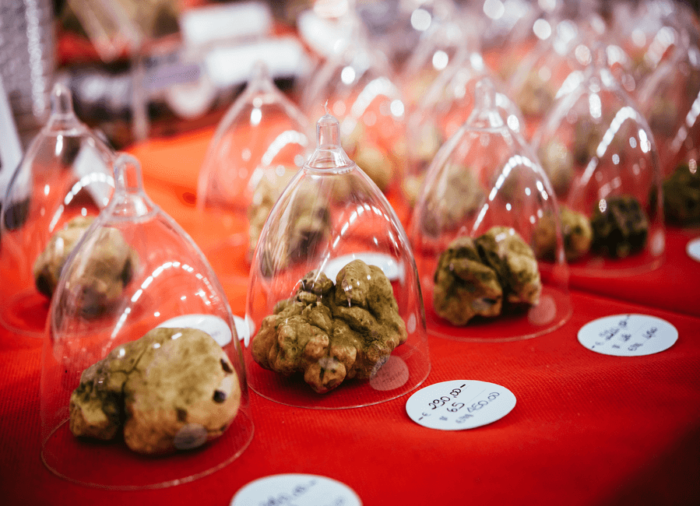 You’ll find markets where truffle hunters sell their wares, truffle-related activities, exhibitions, tastings and pairings. Sometimes there are even ‘stock-markets’, where you can buy truffles on auction. That means you could walk away with one of these gems at bargain-price! You can then put your truffles in your duffle and scuffle off to your next destination (okay, we’ll stop now)! The two biggest are Mostra Mercato di Tartufo Bianco di San Miniato in Pisa (Tuscany) during the last three weekends of November each year, and the Fiera Internazionale Tartufo Bianco d’Alba in Alba (Piedmont) from the first week of October to the last week of November. What could be better? The thrill of the hunt (actually truffle hunts are quite laid back), the howling of hounds and the joy of unearthing an epicurean gem – all in the dreamy Italian hillside. There are dozens of these tours all over the truffle regions in Italy, so you’ll be spoiled for choice. We definitely recommend hiring a typical Italian sport car like Richard and Rebel did above! Looking to plan a food tour of Italy? Check out Elizabeth Minchilli’s Eat Italy guides for ideas!